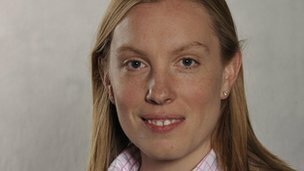 MP Tracey Crouch said the promotion was "disgusting and degrading to women"
A nightclub promotion offering women free entry if they wear low-cut tops has been condemned by MPs. The Casino Rooms Nightclub in Rochester, Kent, is advertising its "National Cleavage Weekender" with pictures of women in revealing outfits. The poster says: "Free entry for exposed cleavage b4 11pm on any night! Only at Kent's biggest & breast party venue." The club's boss has defended the promotion as "light-hearted and fun". The poster adds: "It's not about the size, it's about the presentation!" Tracey Crouch, Conservative MP for Chatham and Aylesford, said: "This is disgusting and degrading to women, particularly at a time when we're trying to do such good work to improve the body image of women of all shapes and sizes. "This is an incredibly misguided PR stunt." Diane Abbott, Labour MP for Hackney North and Stoke Newington, tweeted: "Casino Rooms nightclub in Kent promotes 'National Cleavage Weekender' #everydaysexism." The Everyday Sexism Project was set up by journalist Laura Bates to catalogue incidents of sexism. Since its launch last year, thousands of people have submitted their own examples through social media.